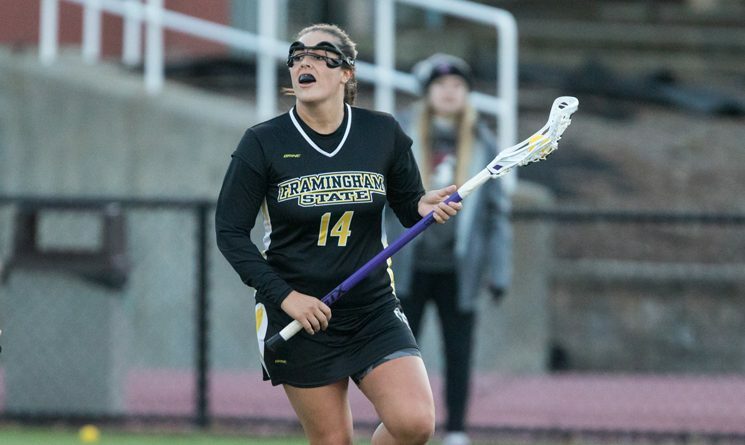 LOS ANGELES, CALIFORNIA – The Framingham State University women’s lacrosse team closed their spring break west coast trip Saturday afternoon and were defeated 14-13 by Occidental in non-conference action at Jack Kemp Stadium in Los Angeles, California. With the loss, Framingham State is 5-2 overall. The Rams took a 2-0 lead on goals by sophomore Alissa Marino and junior Nicole Pacheco (pictured) just under three minutes into the game. Occidental would rattle off four straight over the next seven minutes taking a 4-2 advantage. Junior Audrey Duhaime cut the gap to one with an unassisted tally at 18:02, but Occidental would score three straight opening up a 7-3 lead. Junior Grace Gamache cut the deficit to 7-4 when she converted off a feed from Duhaime, but Occidental pushed the lead back to four just seconds later. The Rams tallied three straight to cut the gap to one with just over two on the clock before the half, but Occidental added a late tally to head to the locker room leading by two, 9-7. Pacheco cut the gap to one in the opening minutes of the second, but Alessandra Pelliccia tallied two straight for the hosts pushing the lead to 11-8. Marino and Pacheco tallied two in a row for the Rams pulling within one with 17:48 on the clock, but the two teams would trade goals down the stretch and the Rams would get no closer than. Pacheco paced the Rams with four goals and two assists, while Marino finished with four markers. Gamached added three goals and three assists, while Duhaime finished with two goals and a helper. Senior Indigo Fox Tree-McGrath took the loss in net making 16 saves. The loss snaps a five game winning streak for the Rams this season. The Rams return to the east coast and are back in action on Wednesday evening when they travel to Connecticut College.